Tired of chasing down hairs and excess debris off your floor? Then we have the perfect solution for you! Our innovative broom and dustpan set is designed to make every sweeping task a breeze. It is light and ergonomically designed to ensure comfort with its non-slip powder-coated grip handle. No more wrist pains - guaranteed! With its easy maneuver feature and the increased tray capacity, it is just perfect for keeping your floors neat and tidy in just one swipe. Also, the broom and dustpan combo is so easy to operate that even kids can help sweeping the floors! With our compact and small broom and dustpan you no longer have to worry about loose hairs, dust, and dirt being stuck to the bristles of your broom. The built-in scraper will make sure to remove them for you so the debris will fall directly into the dustpan. No need to bend over or to get your hands dirty! This amazing broom and dustpan combo has got you covered. 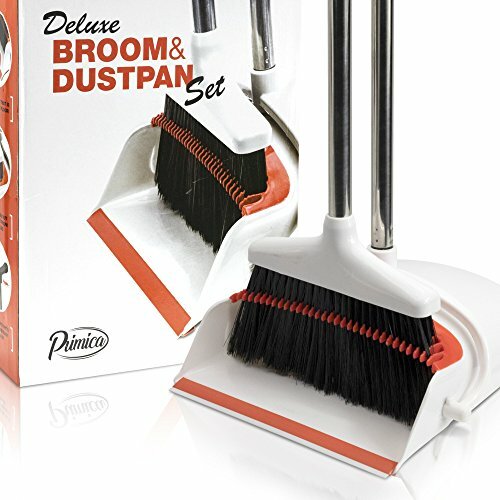 As an added bonus, the sweeping duo can also be stored away inside your cleaning cabinet. Just clip the broom to the dustpan handle and you’re good to go. Pro tip: you can hang it up to make it even more space efficient! What are you waiting for? Give your floor some love and impress your friends and loved ones with immaculately clean floors every time they visit. Make up your mind and purchase our Broom and Dustpan Set that lasts a lifetime! NO-MORE-WISP BROOM AND DUSTPAN: Say goodbye to untangling loose hairs and wisps from your broom bristles. Thanks to the built-in comb scraper, you'll never have to go through that tedious task again! CLIP ON BROOM AND DUSTPAN COMBO: The clip-on feature makes the dustpan and broom upright a perfect space safer! Just clip the broom to the dustpan handle to store in your stand up cleaning cabinet. Plus, you can also hang it up to make it even more space efficient! BROOM AND DUSTPAN LOVE: Who knew it could be so easy to keep your indoor and outdoor space clean? Also, if you're not 100% happy with the hand broom and dustpan set, simply message us and we'll bring a smile back to your face!